Arteries and veins carry blood throughout your body, including your eyes. The eye’s retina has one primary artery and one main vein. When branches of the retinal vein become blocked, it is called branch retinal vein occlusion (BRVO). When the vein is blocked, blood and fluid spills out into the retina. The macula can swell from this fluid, impacting your main vision. Eventually, without blood flow, afferent neuron in the eye can die and you can lose more vision. Patients with BRVO normally complain of abrupt onset of blurred vision or a main visual field defect. 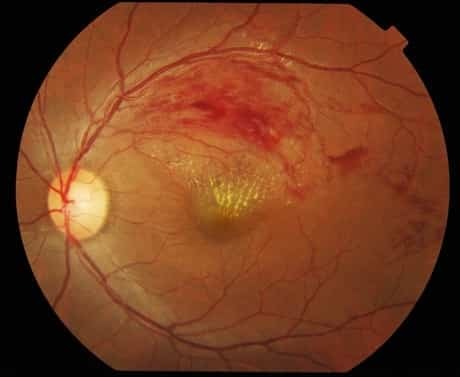 The eye examination findings of acute BRVO include superficial hemorrhages, retinal edema, and typically cotton-wool spots in a sector of retina drained pipes by the affected vein.The blocked vein is dilated and tortuous. The quadrant most typically impacted is the superotemporal (63%). Retinal neovascularization happens in 20% of cases within the first 6-12 months of occlusion and depends upon the area of retinal nonperfusion. Neovascularization is more likely to take place if more than 5 disc diameters of nonperfusion exist and vitreous hemorrhage can take place. Research studies have determined the following problems as risk factors for the development of BRVO: hypertension, cardiovascular disease, weight problems or glaucoma. Diabetes mellitus was not a major independent risk aspect. The diagnosis of BRVO is made clinically by finding retinal hemorrhages in the circulation of an obstructed retinal vein. Fluorescein angiography is a handy accessory. Findings consist of postponed venous filling, hypofluorescence caused by hemorrhage and capillary nonperfusion, dilation and tortuosity of veins, leak due to neovascularization and macular edema. Optical coherence tomography is an adjunctive test in BRVO. Macular edema is typically seen in BRVO in OCT tests. Serial OCT is used as a rapid and noninvasive way of monitoring the macular edema. Numerous alternatives exist for the treatment of BRVO. These treatments aim for the two of the most considerable complications of BRVO, particularly macular edema and neovascularization. Systemic treatment with oral Aspirin, subcutaneous Heparin, or intravenous thrombolysis have not been revealed to be efficient treatments for CRVO and for BRVO no dependable scientific trial has actually been released. Laser treatment of the macular area to reduce macular edema is suggested in patients who have 20/40 or even worse vision and did not spontaneously enhance for a minimum of 3 months (to permit the maximum spontaneous resolution) after the development of the vein occlusion. It is normally administered with the argon laser and is focused on edematous retina within the arcades drained pipes by the obstructed vein and avoiding the foveal avascular zone. Leaking microvascular irregularities might be treated straight, however prominent security vessels need to be prevented. The second sign of laser treatment remains in case of neovascularization. Retinal photocoagulation is used to the involved retina to cover the entire involved section, extending from the game out to the periphery. Ischemia alone is not a sign for treatment provided that follow-up might be preserved. Preservative-free, nondispersive Triamcinolone acetonide in 1 or 4 mg dose might be injected into the vitreous to treat macular edema but has complications consisting of elevated intraocular pressure and advancement of cataract. Triamcinolone injection is shown to have similar result on visual skill when compared to basic care (Laser therapy), However, the rates of raised intraocular pressure and cataract formation is much greater with the triamcinolone injection, particularly the higher dose. Intravitreal injection of Dexamethasone implant (Ozurdex; 700,350 μg) is being studied, its impact may last for 180 days. The injection may be duplicated however with less noticable effect. Although the implant was created to cause less complications, pressure increase and cataract formation is noted with this treatment too. Anti-VEGF drugs such as Bevacizumab (Avastin; 1.25 -2.5 mg in 0.05 ml) and Ranibizumab (lucentis) injections are being used and examined. Intravitreal anti-VEGFs have a low incidence of negative side effects compared to intravitreal corticosteroids, however are currently short acting needing regular injections. Anti-VEGF injection might be used for macular edema or neovascularization. The system of action and duration of anti-VEGF impact on macular edema is currently unknown. The intraocular levels of VEGF are increased in eyes with macular edema secondary to BRVO and the elevated VEGF levels are associated to the degree and severity of the areas of capillary nonperfusion and macular edema. Surgery is utilized occasionally for longstanding vitreous hemorrhage and other major complications such as epiretinal membrane and retinal detachment. Arteriovenous sheathotomy has been reported in small, uncontrolled series of patients with BRVO. BRVO normally occurs at arteriovenous crossings, where the artery and vein share a typical adventitial sheath. In arteriovenous sheathotomy an incision is made in the adventitial sheath adjacent to the arteriovenous crossing and is extended along the membrane that holds the capillary in position to the point where they cross, the overlying artery is then separated from the vein. In general, BRVO has a good prognosis: after 1 year 50-60% of eyes have actually been reported to have a last VA of 20/40 or much better even with no treatment. With time the dramatic picture of an acute BRVO becomes more subtle, hemorrhages fade so that the retina can look nearly normal. Collateral vessels develop to help drain the affected area.